Tiffin Franciscan/US Glass/Bartlett Collins, Bulls Eye or Manhattan. This glass has several companies claiming it. 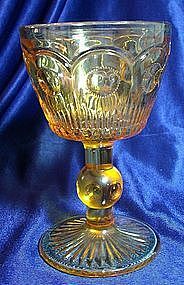 No matter, it is in nice condition, 4 3/4" hi wine glass in amber.